We offer a wide range of auxiliary relays. These are known for high performance and supreme quality. 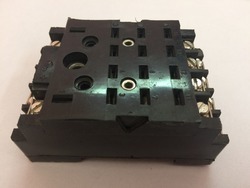 Our over load relays are available in different sizes and models as per the requirement and specifications as per the requirement of the clients. 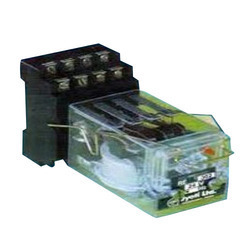 With our efficiency and vast knowledge of the industry, we have come up with a wide array of Auxiliary Relay. The relay movement consists essentially of a cell attracting an armature carrying moving contacts, TN fixed contact-reeds of nine four change over contacts are held in the molded turn- of the relay contacts making surfaces are silver and the contacts are feted in such a way M I; W these ensure a reliable and low resistance contact. The moving contact needs are made of the specially rated material to preserve initial elasticity under the severest switching condition. We introduce ourselves as reputed and trusted the organization to offer a broad array of Relay Plug-In Base. Offered range of product is widely suitable for DC to AC circuit switching in various automation devices, process control, and communication equipment etc. The features are stable performance, high reliability, capable of making and breaking relatively large load current, easy in maintenance and inspection as well as long service life. The plug-in base of the relay is suitable for use with standard 8 and 11 pin sockets.